There are lots of lovely shades of pink with hints of pale lavender and pale blues. I drew my inspiration from image #7 and tried to recreate this peaceful scene that you see above. 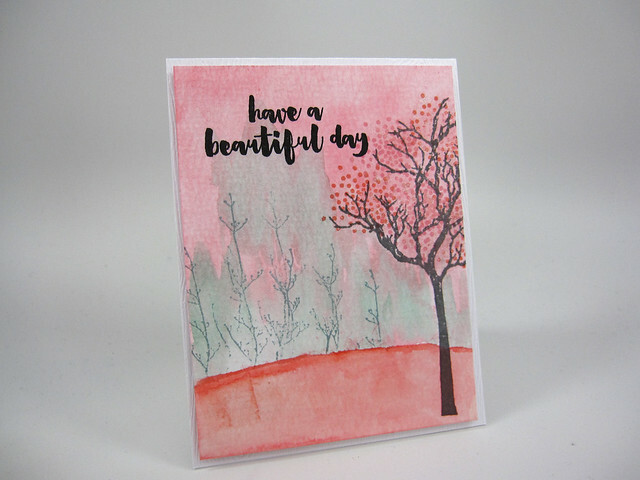 I used a lovely sentiment from Ellen Hutson’s Mondo Magnolia stamp set and the cluster of dots from Ellen’s Bokeh Dots set to create the airy and light look of the foliage/buds in the tree. The tree images in the foreground and background were from a Penny Black stamp and were stamped in a gray archival ink. I didn’t want to use black because it came off as too harsh. The tree in the foreground was stamped multiple times to get the darkness I wanted while the trees in the background were only stamped once to make them look faint in the distance. I add dots of color to the tree in the foreground so that it looked like the tree was beginning to bloom. I used Distress inks like watercolors to paint the sky and the ground. The sky was colored in a wash of 3 pink-toned inks and the ground was created using a wash of coral-colored ink. The mist around the trees in the background was created using a pale green was of distress ink. The sentiment was stamped in black ink. To give the card front a light and ethereal look, I added shimmery dots from my trusty Wink of Stella pen (clear). Overall I am pleased with the effect I achieved, even though my project was a direct interpretation of one the of the inspiration images. Hope you liked the project. Have a great day! Stamps: Ellen Hutson: Mondo Magnolia stamp set (sentiment) and Bokeh Dots (tree foliage/buds). Inks: Distress Inks: Worn Lipstick, Spun Sugar and Abandoned Coral (sky); Abandoned Coral (ground); Cracked Pistachio (mist in the background). WPlus9: Little Pig and Flamingo dye inks for tree buds. Ranger Archival Ink in Watering Can (for all trees). Cardstock: Tim Holtz Distress Watercolor Cardstock (card front); Neenah Solar White 110# cardstock (card base).